A Makeup & Beauty Blog – Lipglossiping » Blog Archive Help me design a Mont Bleu nail file? Please pick your favourite! The guys over at Mont Bleu have invited me to take part in a little design competition for their range of luxury crystal nail files. 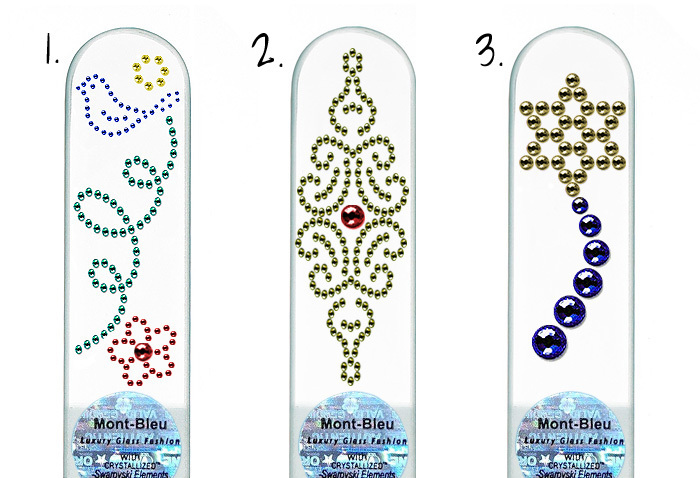 The eventual winner will see their nail file design incorporated into the Mont Bleu catalogue, they will also receive a whole bunch of newly-designed files to giveaway on their blog, and a mosaic picture from crystals. It’s all about those bragging rights! I’ve designed three nail file motifs, each of which completely addled my talent-free brain. I’ve kept the backgrounds transparent simply because I preferred the clean look – each time I added a gradient or colour, it all got a bit too busy for my tastes. I don’t think the designs really need any indepth description, they don’t hold secret meaning… I just played around until I liked what I saw. Please vote for your favourite design (the winner from YOUR votes gets entered into the competition) and if you wish, leave a potential name for the design in the comments. I will choose one of your suggestions to name the winning design before submitting it to Mont Bleu for consideration by their design team. All in all, a joint blog/reader effort! Which nail file design is your favourite? The poll closes at midnight on the 31st July. Get voting and don’t forget to give your favourite design a name! Definitely #2. It looks like a Baroque to me. I like No1…the first thought I got was ‘Peace’ . Definitely 2, and I’d call it Greg. I def like the second one but would reverse the colours! I think I would be quite happy with any of them, a glass file is always a winner and each of the designs would make me smile when grabbing it from my bag!